Recap: I learned a lot from the different leaders on the farm and from doing different jobs with the M-team. Hand seeding-seeding butternut into the ground(direct seeding) and seeding into trays for the greenhouse. Soil sample- taking samples from all the green houses to see if the plants needed fertilizer. -Do the job well- when I harvested lettuce, Sally said for people doing lettuce for the first time, don’t worry about speed, focus on quality, speed will come later. -Adapt to be efficient- There were many jobs that required different skills, we were always looking to see how we could do the job better and use less resources-like time. -keep a good attitude- the people who worked the most hours had the best sense of humor and I think that made the time go faster, but it also made people want to work better too. My thoughts on the Mission Statement GTF prides itself in it’s quality and diversity of produce. But during one Monday Meeting, the topic of conflict came up. Sally said that it is better to say something than to be whining or gossip to someone else about your troubles. Someone brought up the point that they felt undervalued and that people perceived their work as not adding value to the crop. (cultivation) -the victim argued that they were and the point is to be efficient and make the farm money. Sally then said- I get that we need to make money, but I think our top priority should be respecting one another and what they do. I care about how we treat each other. Everyone nodded in agreement. During my time at GTF I saw that the people working there did care for one another and the farm was more about a sense of community than just food. I feel honored to have been a part of that community. So I mentioned earlier that GTF has 16 tractors (!) John Deere, Kubota, Allis Chamlers, Landini, Farm All, Ford- and quite a few more. I drove three while I was there! 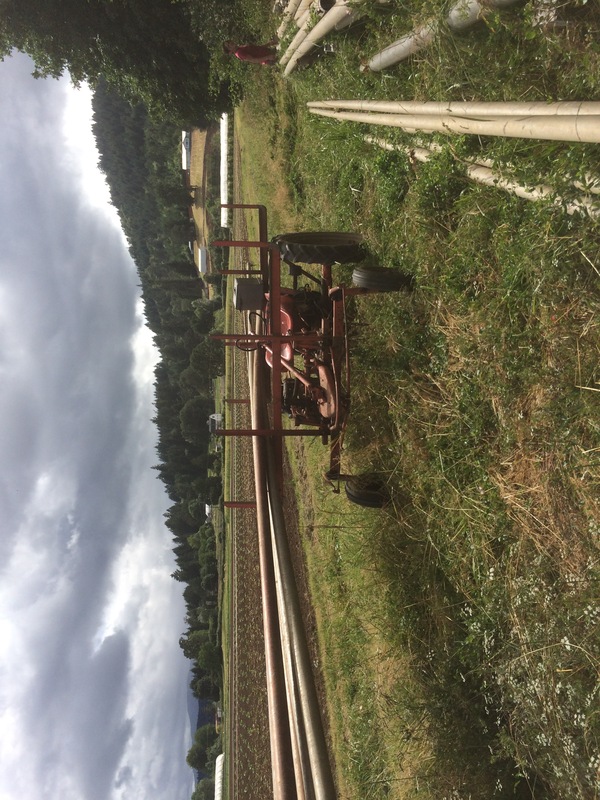 I used a model G Allis Chalmers to transport irrigation pipes, a Ford for transplanting with the high speed transplanter and the Landini for the lay-down transplanter. 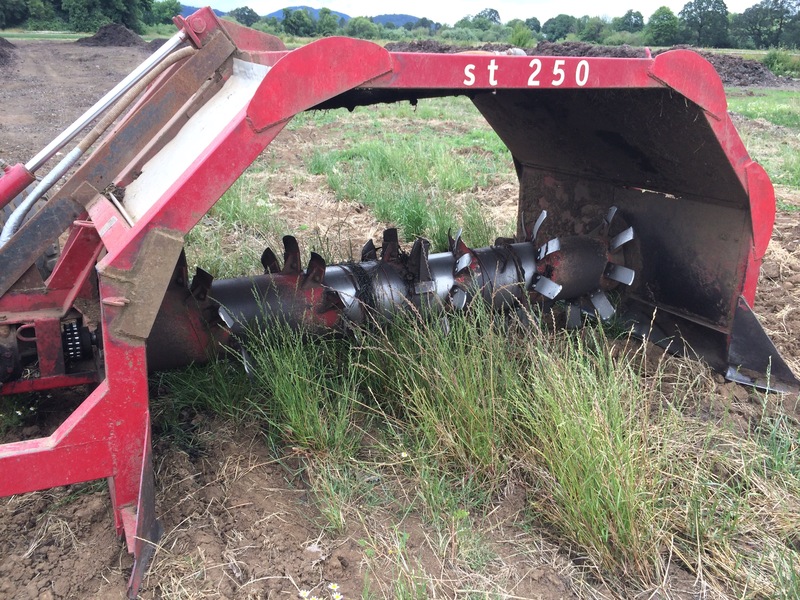 Transplant: GTF has two main transplanter, a “high speed” transplanter and a lay-down transplanter. One might wonder why use the lay down transplanter if there is a faster one, well the leaves of some plants are too big to fit in the cups of the high speed transplanter, I wish it were different though. The lay-down is as the names suggests, the people lay down on boards behind a spinning spiked wheel. The wheel has a spike every six inches, so we would plant every other hole or every fourth hole opened on the spacing of the particular plant, Brussel sprouts, (2 ft) to swiss chard (1 ft. ) The high-speed has a spinning carousel that we would fill up and it would rotate and drop the plant into a shoot that would plant it in the ground. On the lay-down we would have to use trowels to make the holes big enough to put the plant in and then cover it up so the root ball wasn’t exposed. Thank goodness a lot of the other vegetables fit with the high speed. 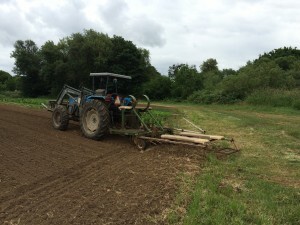 Another complication with transplanting on the tractor side was driving in a straight line. It was a combination of following a previous tire track and sighting the middle of the front of the tractor with a line left by field prep. 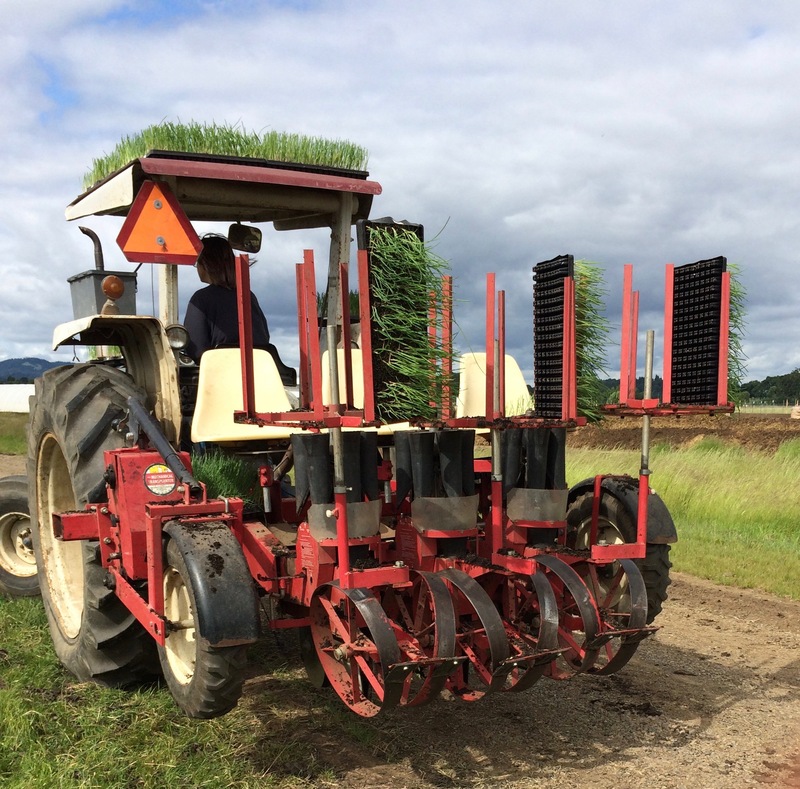 Field prep: Rodrigo (in charge of the field crew) uses a rotary harrow (rotarrow) to decompact the bed and have it ready for transplanting. Cultivation: to keep the young plants healthy, there is a lot of cultivation and hand weeding going on. GTF has two people who just cultivate fields. They use a mix of spider gangs, danish s hooks (for bigger weeds) and basket weeders (for just emerged seeds). GTF also uses a flame thrower after planting carrots. Carrots take a while to emerge and are really slow, weeds take advantage of this. Flaming after planting carrots will kill a lot of the weeds. 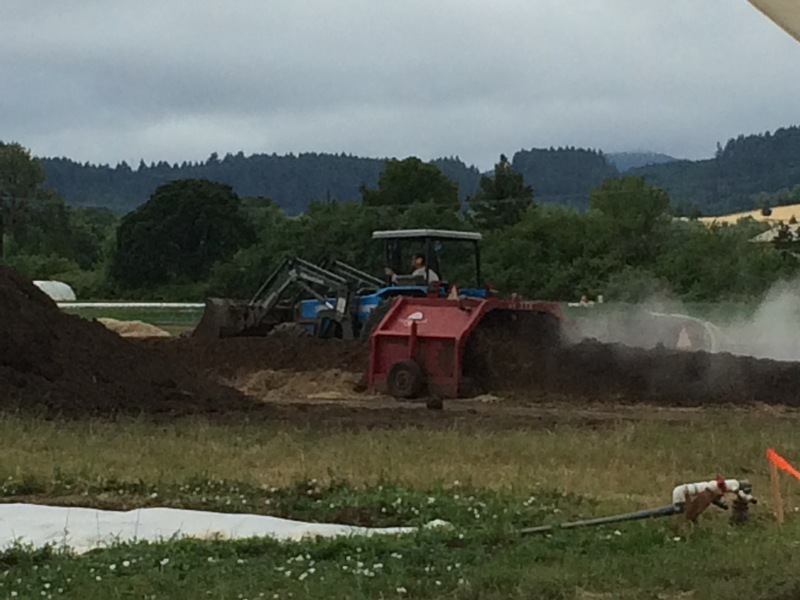 GTF uses a lot of compost on their fields, as well as leaf mulch for root crops like onions and shallots. 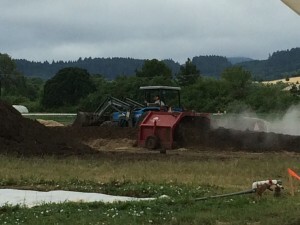 They have 10 or so ~400 ft wind rows of compost that Josh will turn. All the leaves and suckers from tomato trellising will end up in a compost pile, as well as food scraps, rabbit manure from up the road, horse stall bedding, and all the leaves that are raked up in the fall from the area. Rabbit manure is Josh’s favorite because it has a lot nitrogen. The finished product is beautiful, black, and fluffy compost. My thoughts: I got to drive tractors! Rachel who is in charge of the M team had to do other jobs so they put me in to steer the transplanting. One more of the many things that GTF does is a CSA. 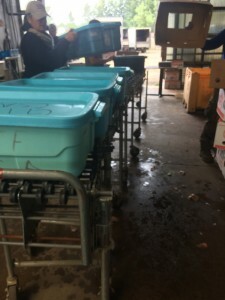 They farm and sell produce all year round, but in the winter they have less to sell and an influx of cash from the CSA helps them in the spring. 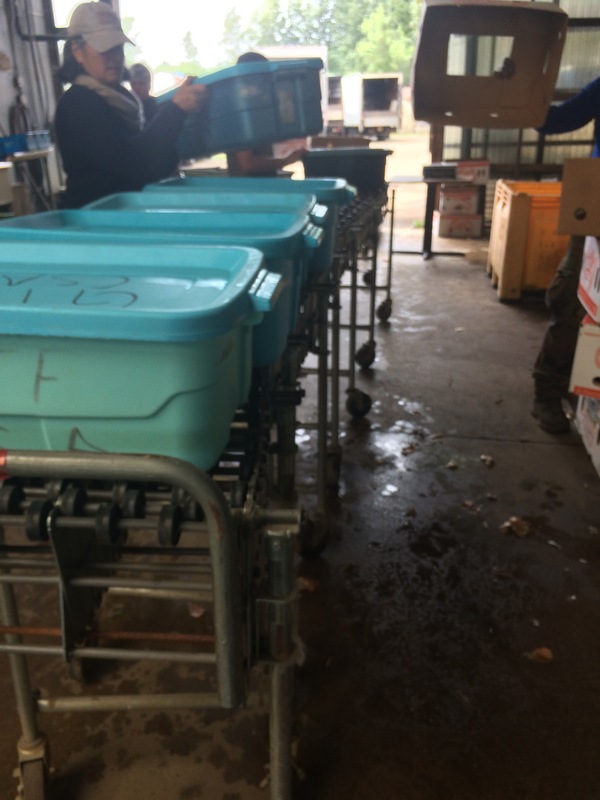 They have an efficient assembly line with an expandable rack with wheels that the boxes can roll down and each person puts one thing in. 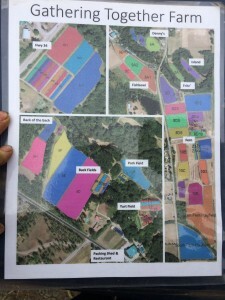 Then they are put on pallets according to the location where they will be picked up. My thoughts: Our jobs are varying a little bit, with transplanting and harvesting boysenberries before markets, but it is nice to have a routine and to know what is expected of us. It also helps to know that we are working towards one goal and the farm is also working towards that goal of producing quality produce. Though the farm ultimately has to make money to keep going and support the employees and community, they are open to trying new varieties. 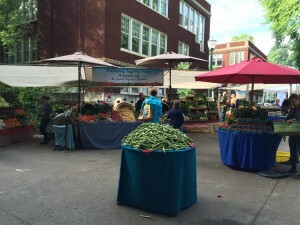 GTF has a good relationship with seed companies and extension at OSU. GTF plants a lot of trials for OSU but also for themselves. While I was there we planted super sweet corn varieties for OSU. Some didn’t even have names yet. GTF also tried out 6 different root stocks for each tomato variety to see which combination did the best. Joelene is in chards of seeds and plants and gives a list of what needs to be seeded or transplanted. Rodrigo says what is going to be harvested. Joey says all the fields and crops he is going to cultivate. Josh, who does compost doesn’t add anything, he just keeps up turning the compost (still very important). The soil fertility checks are done by John Yeo and he says what kind of tests he is going to run and for what plants. Chris who works in the office brings printed sheets of the week’s forecast. Overseeing this all are John and Sally. John will provide wisdom and Sally resolves tension. I really like the meetings because they set the priorities of what needs to be done each week and who does what. 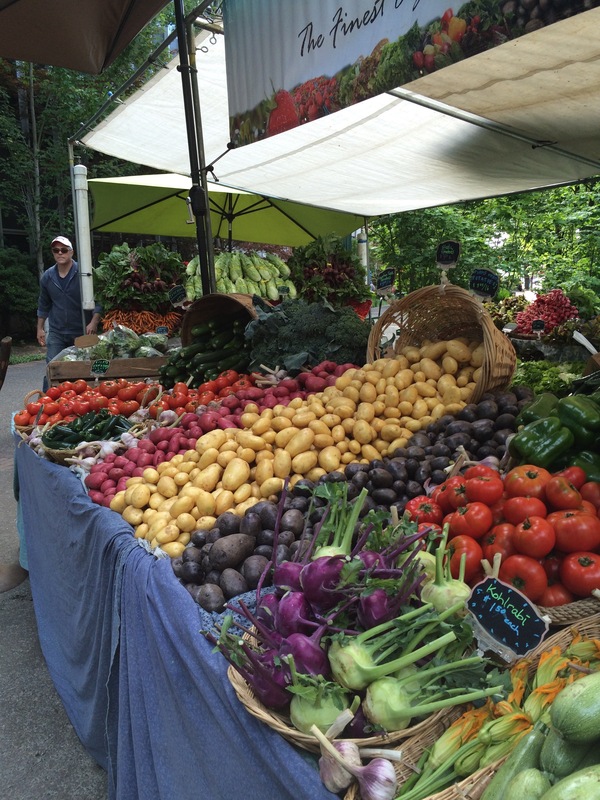 GTF (as people refer to the farm) has a lot of different ways they sell their produce. They sell to 8 different markets, have over 100 CSA members, wholesale to restaurants and local grocery stores, they have a farm stand, and they also have a restaurant. People travel from all over Oregon (and probably surrounding states too) to eat there. It is ranked 2 out of 12 restaurants in the Philomath area by trip advisor. 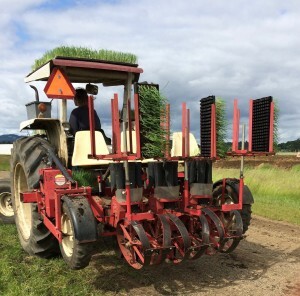 (https://www.tripadvisor.com/Restaurant_Review-g52017-d1526937-Reviews-Gathering_Together_Farm-Philomath_Oregon.html) And for good reason. The restaurant makes their own pasta and bread and uses local ingredients. 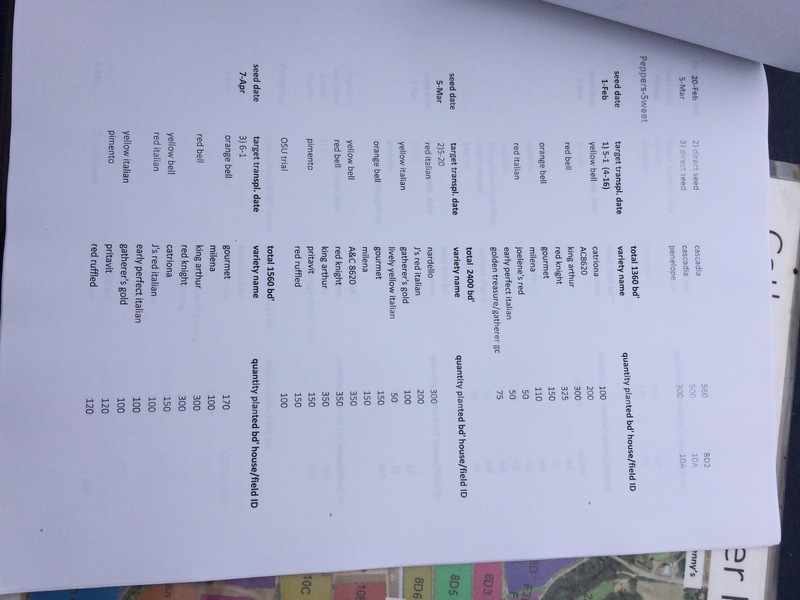 The menu is based around what is available on the farm. They had a special salad with strawberries when they were in. (It was delicious). The restaurant is a good way for people to come visit their stand, and a good way to use excess vegetables. The Saturday markets I’ve worked have been the most informative. They really focus on their display and have a couple rules they go by. Displays must look bountiful. 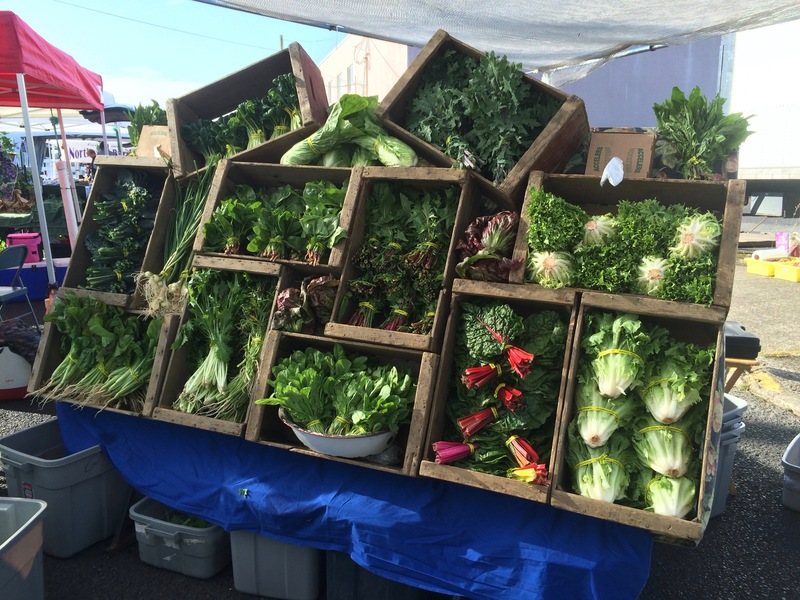 when setting up, they use rustic boxes and baskets in asymmetrical arrangements and overflow them with vegetables. During the market this means constant resupply. no customer wants to by the last piece of garlic. Keep ready customers away from displays. GTF sets up a separate section for check out. This way customers who already have what they are going to buy don’t block access for other customer still gathering produce. It also creates a nice flow and prevents congestions. Also a visible line can draw more curious customers in. Know your food. At all the markets I’ve been to have a sampling area. Someone prepares some of the vegetables on display, usually odd ones that people might know about, like chickory or tatsoi. If customers have questions about preparations, the people working there should be able to give a recipe. Head math and keep the line moving, except when you don’t want it to. John Eveland promotes employees adding up customers’ totals in their heads to be efficient. It can also keep a busy line moving. But if the line isn’t long, he suggests making as much small talk as possible to keep the customers there to give the illusion of lines, to draw more customers in. Time is flying by, I’ve enjoyed working with some great people and can’t believe it is already half over. 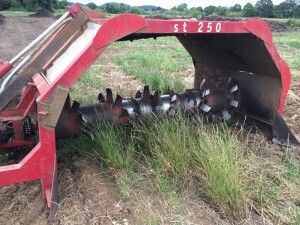 Working with GTF has made me even more excited to work on my farm. It has also made me grateful for our smaller size. 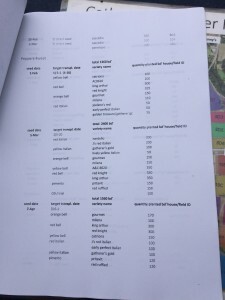 GTF provides a lot of food for the community, but it is so big and hard to keep track of everything. I’ve been doing some work with the M-team and asked what the “M” stood for. Rachel, who is the leader in our two person team said people like to call it “mighty”, but she then admitted it means miscellaneous. 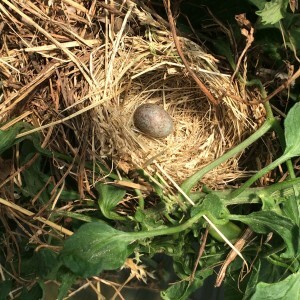 We’ve had the special project of keeping all the Tomato houses up to date with trellising and snapping off suckers so the plant can focus it energy on the fruit. Regular tomatoes have one leader or one main stem, and any other stems that usually shoot from between the stem and branch, we take off. Cherry tomatoes have two leaders and we take off any other suckers. Then we wrap the twine around the stems, tight enough to hold it up and prevent bending, but not too tight the we snap it off. We work on that unit lunch and then we usually swap over to transplanting. 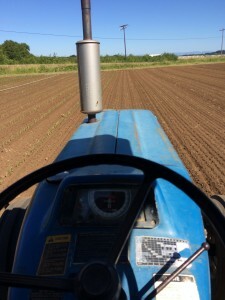 We use a high-speed transplanter (more on that to come-Machines), though the name might suggest something fast, the tractor crawls while the people sitting in the back are struggling to keep up with filling cups with ready to plant plants. When we are not transplanting or trellising, we are helping irrigate. 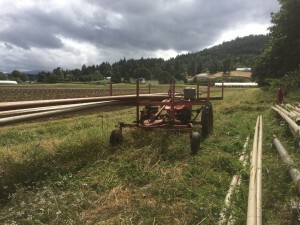 The summer months are extremely dry and irrigation is something that happens everyday in at least some field. Back home we hope for enough rains to never irrigate, but sometimes we will have to occasionally. 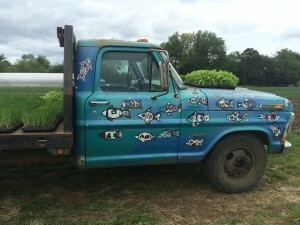 Over the first week I got a feel for how many farm truck their are. There are at least ten different trucks, while that might seem like a lot, there still seems to be a shortage when you really need a flatbed truck to transport transplants to field 8D10. And I’ve categorized them into two groups: ones I can and can’t drive. Most fall into the latter category because they are manual. Soo… Rachel has been giving me lessons, I have successfully shifted to second gear and back down, but thats about it. It is a skill I feel I need and hope I come back to New Hampshire a proficient driver. Working on a farm, one might expect good food and good farming to go hand in hand, on GTF it might even go one step farther. Everyday at 10:00 there is snack. Usually consisting of pastries or egg burritos, it is worth looking forward to during the weekends. Lunch is served Monday, Wednesday, and Friday at 1:00. It is an even bigger production and the highlight of the day. It has been a great first two weeks. I’m still adjusting and starting to feel more confident about my work. I’m learning a lot about organization and prioritization and still have a ways to go (so those sections will be later). Gathering Together Farm has been a certified organic farm since 1987. They farm over 50 acres and in the height of the season they have around 120 people working in the fields, restaurant and market. 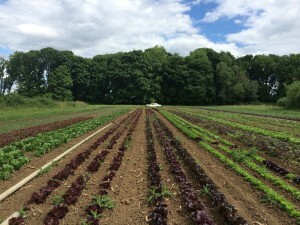 The farm is owned by John Eveland and Sally Brewer but management is divided up over various groups like cultivation, harvest, planting, restaurant, and fertility. I am interning on their farm for six weeks, I’m looking to learn about their organic practices and how they organize their priorities. 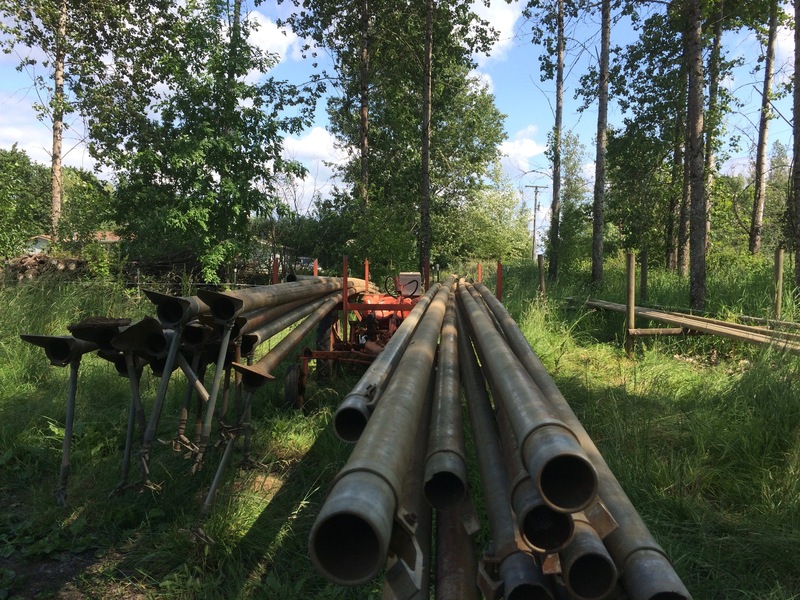 There are probably at least ten different things that can be done on a farm at any given time, but how do you decide what needs to be done? How do you partition labor and organize crops, I hope to have a better idea. I’m always a little nervous to start new things. Everyone was telling me that my bosses John and Sally are the nicest people ever so naturally I was skeptical. They certainly seemed nice when I talked to them over the phone, but I didn’t know what to expect, I had from 2:30 am driving to the airport to landing across the country and another hour drive to Gather Together Farm to speculate. But of course Sally said that I and my mom’s friend(who lives in the area and who drove me) could have lunch in their restaurant and when we stepped into the place, the waitress was excited to meet me and I met the person I was staying with, who instantly gave me the key and invited me to eat dinner with them. John and Sally showed up, they were trying to figure out what to do with an extra 18 flats of strawberries that an order didn’t want anymore. But they introduced themselves, gave me hugs, and we sat down to the most delicious lunch. 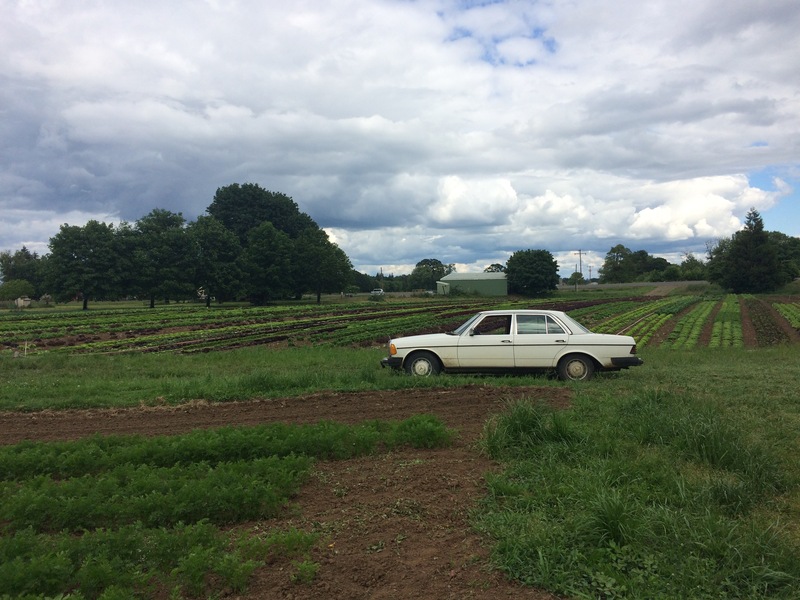 After lunch my mom’s friend and I hopped into one of their farm cars and got a tour of the various fields. 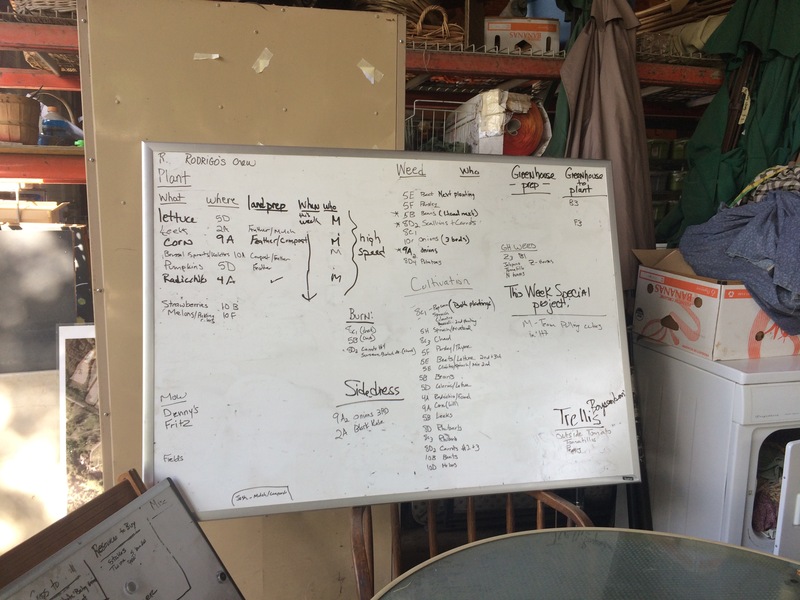 Over the years John and Sally have incorporated surrounding fields into their production, its a lot to keep track of, so every field has a name. 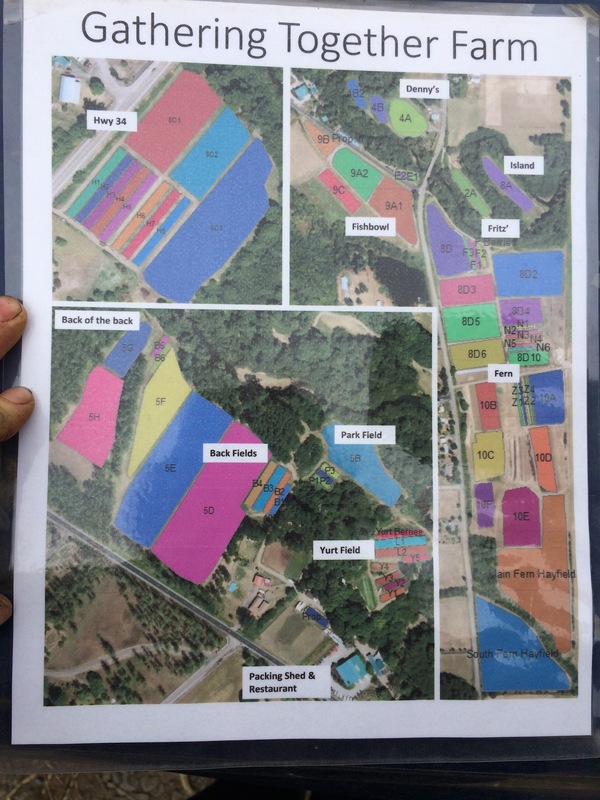 This helps organize where lettuce is going to be transplanted or what fields needs to be cultivated. Its a lot to take in, the farm is twice the size of mine back home, with over a hundred employees, (compared to our 20). There are so many more because they have a restaurant and they hire people just to do markets. The markets over fifty miles away and the truck hauling the produce can carry two people at most and the Portland market needs 8!. I’m looking forward to seeing how it is all managed.